Today I dug out the area for the heating cables in the south patch. Put them about 8 inches down into the ground and then buried them. This will be the same area that the hoop house will go in a couple of weeks. The corner flags will stay there all season. They help me make sure I don't till them and make it a little easier to dig up the cords in the fall. 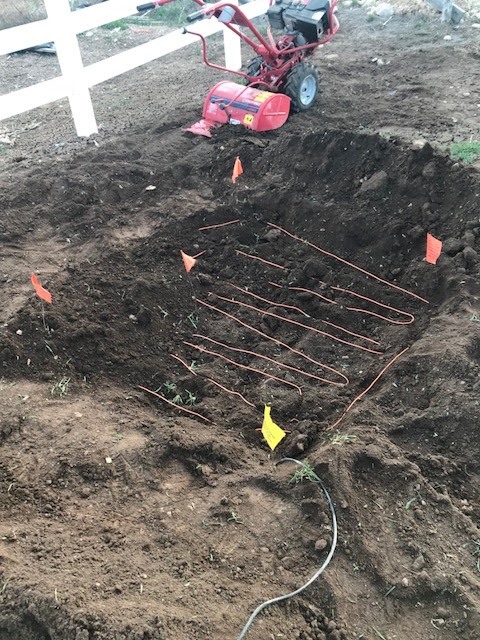 The center flag is were I'll be planting the pumpkin plant. I'm going to start my seeds five days later this year. The first weigh-off is a week later this season and I felt like I was cutting it too close last season with getting the plants frosted. Last frost for me is around June 1st. 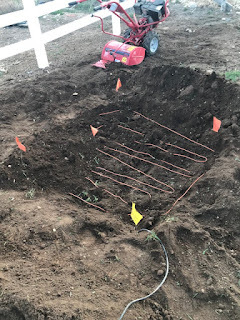 I was out of the hoop house well before that and had some nights around 38 degrees last year, so better safe than sorry. I'll still have two more days of growing this year, so I think I'll be in good shape in the weather will cooperate.